In the introductory article, I invited you to imagine the narrative of a painting by Nicolas Poussin. If you have not done this and still want to, please go back to that article, as the rest of this will prove a complete spoiler for it. This is the painting in question, and the centrepiece for this article. Nicolas Poussin (1594–1665), Rinaldo and Armida (c 1630), oil on canvas, 82.2 x 109.2 cm, Dulwich Picture Gallery. Wikimedia Commons. There are several strong clues to it being a narrative painting. First is the fact that it is dominated by figures: two humans and a cherub-like creature which is actually an amorino, a Cupid if you wish. Behind them is a landscape which contains no other relevant detail, and can safely be ignored. Look at the figures, and their faces (particularly that of the woman) are overtly emotional, and their postures are those from the midst of action. These are clearer in the detail below. Nicolas Poussin (1594–1665), Rinaldo and Armida (detail) (c 1630), oil on canvas, 82.2 x 109.2 cm, Dulwich Picture Gallery. Wikimedia Commons. The composition is relatively simple, and intended to display the event which is taking place. The sleeping warrior is presumably tired, perhaps from battle. The woman is the centre of conflict: in her right hand she has a thin-bladed dagger which is unmistakably pointed at the sleeping warrior, but the amorino is restraining that arm. Her left arm, though, is almost caressing the hand and head of the warrior. Between them her face appears puzzled and anxious, reflecting her inner conflict. 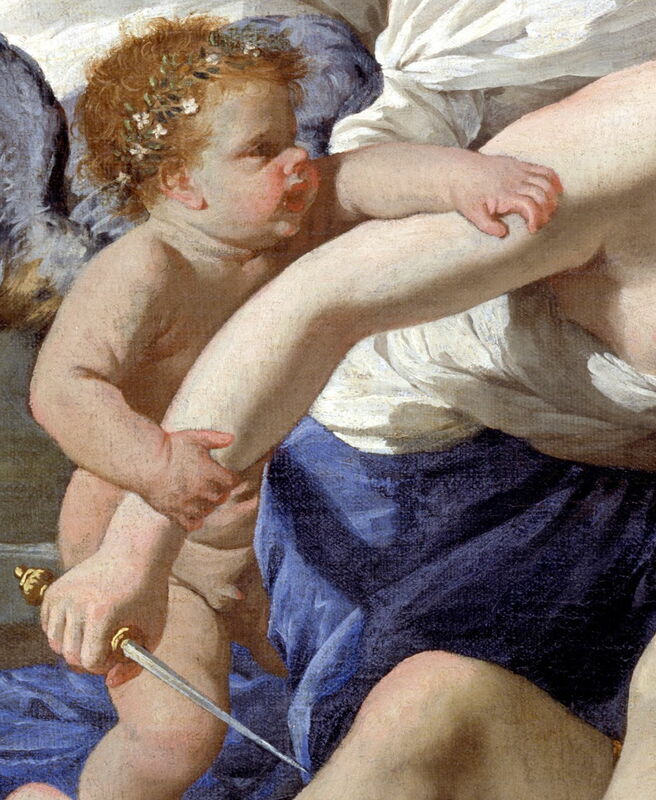 She clearly intended to murder the warrior with the dagger, but the amorino is urging her to love him (probably physically, given her state of undress) instead. We can suggest many reasons for her predicament and conflict, but without knowing the actual underlying narrative, it is impossible to choose between them. The painting is one of six surviving works by Poussin which illustrate scenes from a hugely popular epic poem by Torquato Tasso (1544-1595), a prodigy of the late Italian Renaissance, titled Gerusalemme Liberata (Jerusalem Delivered), and published in 1581. Jerusalem Delivered tells a heavily romanticised and largely fictional account of the First Crusade, which culminated in 1099 CE. Several of the individual stories within its great epic sweep involve conflict and romance between opposing Christians and Muslims, which often resolve with the Muslim woman being converted to Christianity. This particular episode involves Rinaldo, the greatest of the Christian knights engaged in the crusade, and the Muslim (or ‘Saracen’) witch Armida, who has ancestral influence from Homer’s Circe and Ariosto’s Alcina. Early on, Armida seeks aid in the Christian camp, seduces knights, and sows division among them as a result. She then takes a group of knights with her, and turns them into animals using her magic. In this scene (Canto 14, Esolen p 281), Rinaldo has been secretly pursued by Armida, who intends to murder him with her dagger. He stops to rest near the ‘ford of the Orontes’, and takes his helmet off. He first hears Armida swimming in the river, goes to see, and discovers her naked. She sings to him, and lulls him into an enchanted sleep so that she can thrust the dagger home. As she is about to do that, she falls in love with him instead. It is this moment which this painting illustrates. Rather than killing him, she enchants him and abducts him in her chariot, to a magical island where he becomes infatuated with her, and forgets the crusade. Two Christian knights, Carlo and Ubaldo, who were close companions of Rinaldo, find the castle in which he is held by Armida. They give him a diamond mirror, so that he can see the state that he is in, and return to the reality of the Crusade. The three return, leaving Armida heartbroken at her loss. She later raises an army to fight the Christians and kill Rinaldo in vengeance, but they are defeated. As she is attempting suicide, Rinaldo finds and prevents her from doing so. He then converts her to Christianity. Rinaldo and Armida are shown in a slightly modified version of Tasso’s account, with Armida partially clad rather than naked. The amorino is a personification of her love for him, much in the way that we might attach the icon of a small devilish putto to indicate morally bad ideas. 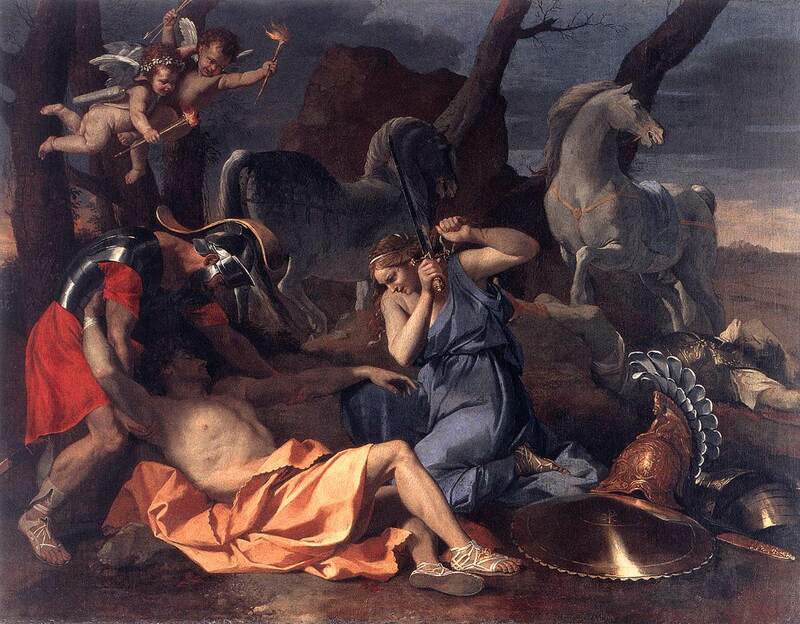 There are two quite distinctive, almost formulaic, elements in Poussin’s depiction: Armida’s facial expression, and the ‘body language’ of her posture, particularly the conflict between her arms. Nicolas Poussin (1594–1665), Rinaldo and Armida (detail) (c 1630), oil on canvas, 82.2 x 109.2 cm, Dulwich Picture Gallery, London. Wikimedia Commons. Facial expressions have long been associated with different emotions, in paintings and other narrative media such as the theatre. Even late into the nineteenth century, there were collections of prints and books which showed a range of stereotypical expressions intended to help artists and illustrators who were engaged in producing narrative works. 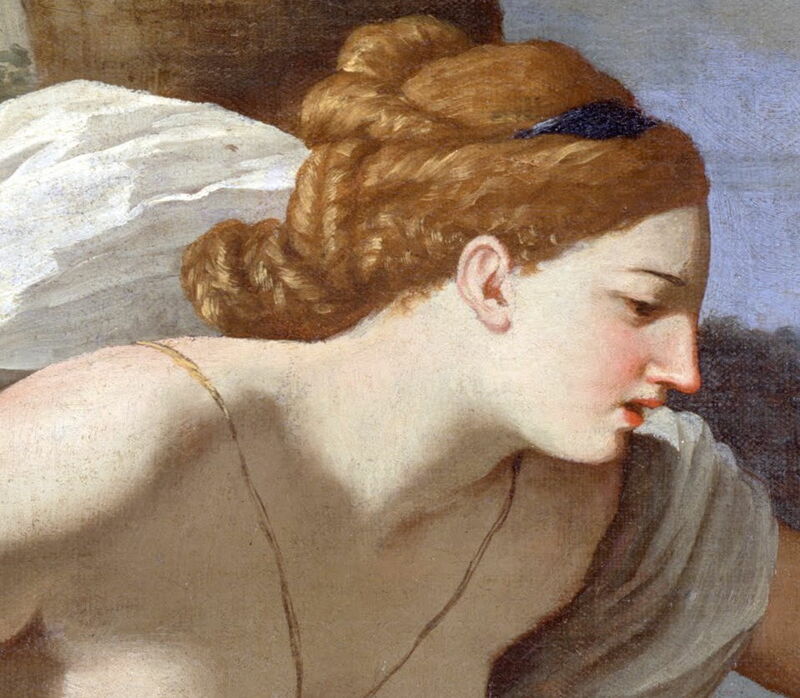 Although Poussin appears to have avoided such stereotypes, Armida’s expression is a key graphical element in understanding the narrative here. In the Renaissance, emphasis was also placed on the disposition of all parts of the body, and their role in conveying action and emotion. Leon Battista Alberti’s cardinal work On Painting (1435-6) devotes much of its second book, The Picture, (paragraphs 38 onwards) to instructions about the positioning of body parts in the construction of Historia, narrative painting. Nicolas Poussin (1594–1665), The Companions of Rinaldo (c 1633-4), oil on canvas, 119 x 101 cm, The Metropolitan Museum of Art, New York, NY. Wikimedia Commons. 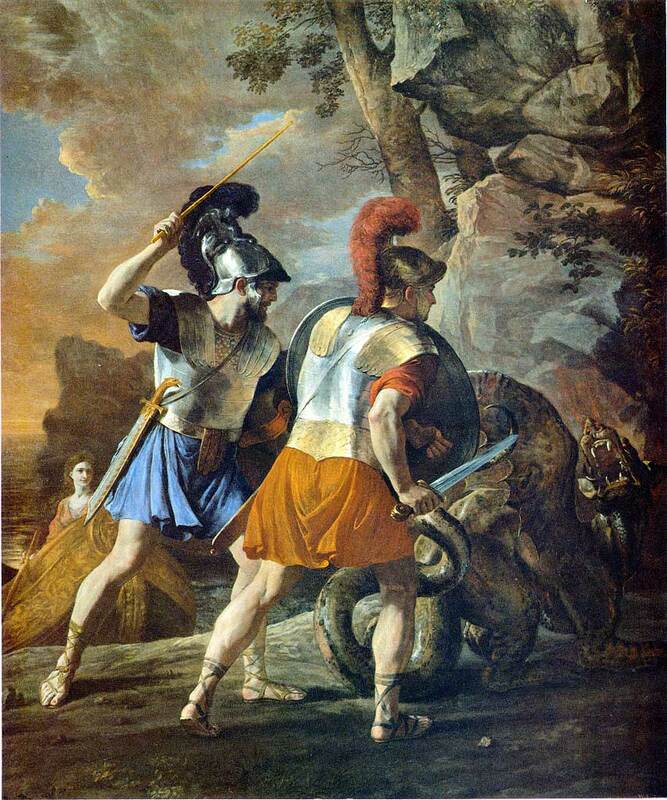 The Companions of Rinaldo (c 1633-4) shows the two companions of Rinaldo, Carlo and Ubaldo, confronting a dragon during their quest to locate and rescue Rinaldo from the clutches of Armida. Nicolas Poussin (1594–1665), Rinaldo and Armida (c 1635), oil on canvas, 95 × 133 cm, Pushkin Museum, Moscow. Wikimedia Commons. Rinaldo and Armida (c 1635) is a later and more explicit version of this same narrative episode, in which Armida is falling in love with Rinaldo. There is a multiplicity of amorini who seem less engaged in the action. The river appears more symbolically as being poured from a pitcher. In the background, Armida’s chariot is already prepared for the next event in the narrative, Rinaldo’s abduction. Nicolas Poussin (1594–1665), Tancred and Erminia (c 1634), oil on canvas, 75 x 100 cm, Barber Institute of Fine Arts, Birmingham, England. Wikimedia Commons. 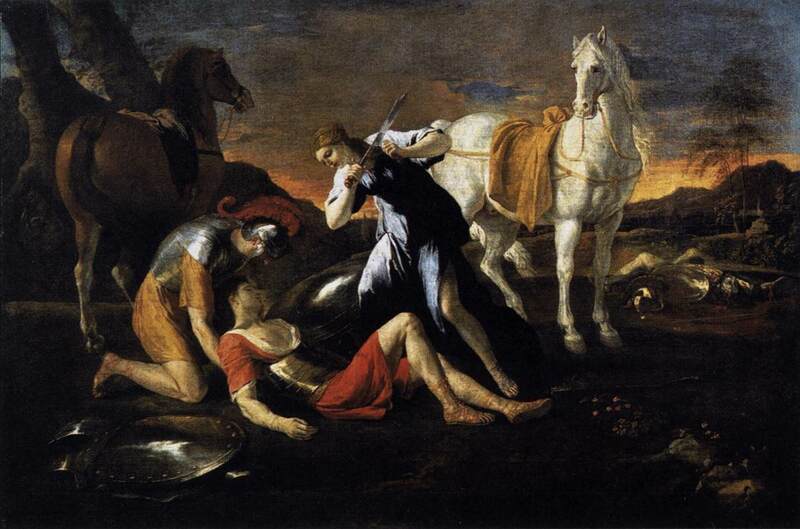 Tancred and Erminia (c 1634) is another fine painting, in which Tancred, a Christian warrior, lies wounded after slaying the giant Argantes (in the middle distance on the right). Erminia, a Saracen princess who has fallen in love with Tancred and converted to Christianity, is cutting off tresses of her hair to bind his wounds. The amorini here are to strengthen their relationship, and the warrior also tending to Tancred, at the far left, is his esquire. This is taken from Canto 19 of Tasso’s poem. Nicolas Poussin (1594–1665), Tancred and Erminia (c 1631), oil on canvas, 98 × 147 cm, Hermitage Museum, Saint Petersburg. Wikimedia Commons. Tancred and Erminia (c 1631) is another, slightly earlier, version of the same episode as above. 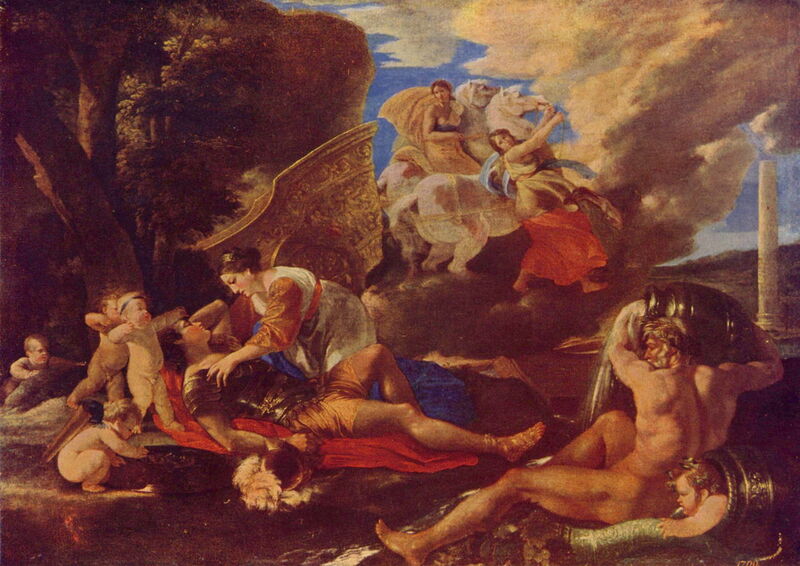 Poussin also painted The Abduction of Rinaldo (1637), which shows Armida abducting the sleeping Rinaldo to her island, and several drawings exist for other episodes of Jerusalem Delivered. These beg the question as to whether he made other paintings which are currently lost. Esolen AM (trans) (2000) Jerusalem Delivered, Gerusalemme Liberata, Johns Hopkins UP. ISBN 978 0 8018 6323 3. Sinisgalli R (2011) Leon Battista Alberti ‘On Painting’, a New Translation and Critical Edition, Cambridge UP. ISBN 978 1 107 00062 9. Unglaub J (2006) Poussin and the Poetics of Painting, Pictorial Narrative and the Legacy of Tasso, Cambridge UP. ISBN 978 0 521 83367 7. Posted in General, Painting and tagged Armida, Crusade, Jerusalem, narrative, painting, Poussin, Rinaldo, Tasso. Bookmark the permalink. Thank you. Hopefully you will find today’s article about other versions of this narrative painting of interest too: it will be published later. I love art history and the narratives really give me an idea of the artist was thinking. Is your Mac a nightmare to update?